FEW Spirits, out of the great city of Chicago (well, Evanston, to be exact), has won boatloads of awards and received a good bit of acclaim as one of America’s leading craft distillers. Their rye whiskey was awarded Whisky Advocate’s Craft Whiskey of the Year in 2013, and their bourbon and barrel-aged gin join the rye with gold medals from the Beverage Testing Institute (if awards are your kinda thing). This spring, FEW expanded their distribution to include Georgia (and a few other states, they’re now up to 20 plus Washington D.C., and a handful of countries outside the U.S.), and sent me a few samples to get to know them better. Having spent a good amount of time in Chicago previously, I was well aware of FEW, but it was good to revisit their four main products. The coolest thing about FEW is that they really make an effort to keep their production locally rooted – sourcing as much of their grains as possible from within 100 miles of the distillery, where they do all the fermentation, distillation, aging and bottling on-site. They famously grow the Cascade hops used in their American Gin in founder/distiller Paul Hletko’s own backyard. Herewith, some quick thoughts on their two primary whiskeys (one bourbon, one rye) and two primary gins (one regular, one barrel-aged). The rye, in particular, stands out to me as an excellent craft spirit worth seeking out. Oh, and don’t you love those photos up above? 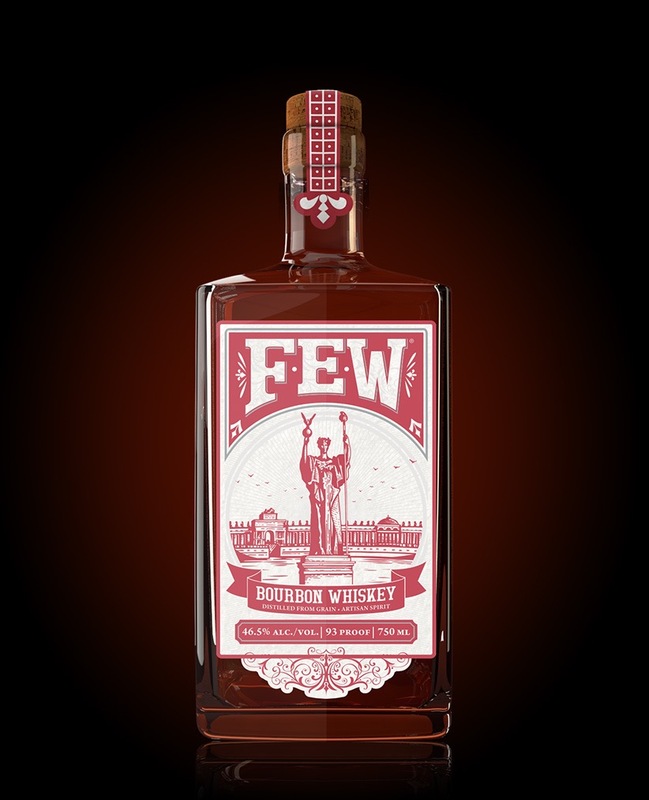 They come courtesy of FEW’s website, which also features a number of cocktail recipes for each spirit when you’re ready to play. Interestingly, FEW’s American Gin is made from a wheated bourbon mash (70% corn, 20% wheat, 10% malted barley), with an intentional focus on the grains. They also include Cascade hops in the botanical blend and whole vanilla beans, plus more typical gin botanicals like juniper, bitter orange and lemon peel. Mild at first, with notes that may have you thinking … “vodka?” … before some interesting hints of green lemongrass and waxy vanilla seep in. Again, it’s mild when you first taste it, but you can pick up the subtle presence of the corn and grains, then a lingering acidic tingle with a juniper base finally jumps in on the lovely finish. This one grew on me and benefits from some air – and will do nicely in cocktails that call for a mild-mannered gin or as an introductory offer to any gin-averse friends. FEW’s Barrel Gin actually uses a more neutral base than the American Gin (distilled to a higher proof and thus less grain presence coming through), and is also flavored with different botanicals to better harmonize with the barrel-aging. It goes roughly 6 to 9 months in a combo of new oak and FEW’s used bourbon and rye barrels. With just a whiff, this is much more intriguing than the American Gin, and – to me at least – you get both more of a gin/juniper presence AND the effects of the barrel also emerge in notes of warm sandalwood. Also on the nose, there’s a bit of lemon Pledge (in a good way!) and tropical fruit… think grilled pineapple. Sipping the aged gin also shows a nice layering of flavor, fairly rich and lush, with a lovely waft of floral notes coming in and out. The wood remains in the background, warm but subtle, and again the finish has a nice lingering juniper character that really shines. 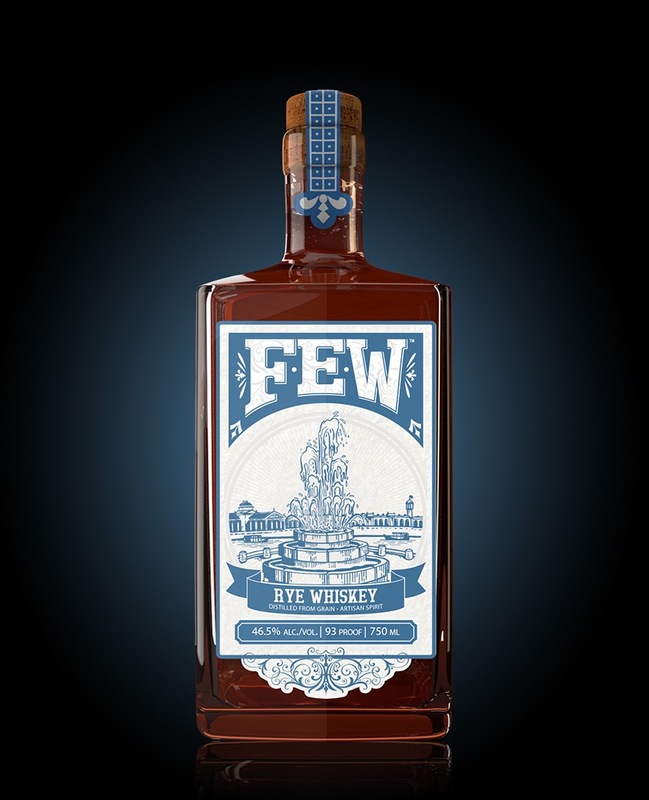 FEW’s bourbon mash bill is 70% corn, 20% rye, 10% malted barley, and is fermented with a beer yeast that FEW says helps bring out some spice notes. No age statement, but it’s generally between two and three years. Give this a bit of air, too, to fully open up. The nose is quite nice, with some maple syrup, sawdust, and plenty of corn silk and that malt presence. Sipping, though, it comes across very young, in a not entirely pleasant way if you’re not a fan of young whiskies. I have a feeling this would really benefit from another couple years in the barrel, but as it stands, would have a hard time choosing this over much cheaper bourbons from larger distillers. The rye mashbill is 70% rye, 20% corn, 10% malted barley, and is fermented with a Loire Valley wine yeast that FEW says brings out fruity notes. The nose on this rye is super interesting, some cinnamon, deep juicy plum, clove and baking spice swirling around in a heady ethereal way. There’s a fascinating richness to it that is almost moving into Port territory. Sipping neat, more complexity still, a deep grape quality, a touch of sharp mint, and a background buzz of Christmas spice that builds on the finish. I’d love to see this one with a bit more barrel time as well (it’s also under four years), but it’s in a great place. My favorite of all the four FEW spirits tasted. Full Disclosure: Tasting samples provided by FEW.